Marvel at iconic St. Basil's Cathedral, attend a performance at one of St. Petersburg's historic theaters, visit Catherine Palace as well as the summer palace of Peter the Great, and explore the famed Hermitage Museum. Arrive in Moscow, the capital of Russia, where you are met and transferred to your hotel, situated steps from Red Square. Gather this evening for a welcome briefing followed by dinner. Tour two of the Kremlin’s cathedrals as well as the State Armory, home to priceless artifacts dating to the 14th century, and enjoy exclusive A&K Insider Access to the Grand Kremlin Palace, official residence of President Putin (subject to closure for official functions). Later, tour the Moscow Metro, before dining at a local restaurant. Visit the Park of Fallen Idols, Sparrow Hills and other key sites around the city. Enjoy lunch at a private restaurant as you revisit the pivotal era of Perestroika with an in-person talk from Mikhail Gorbachev’s personal translator. Later, view fine art in the Tretyakov Gallery. 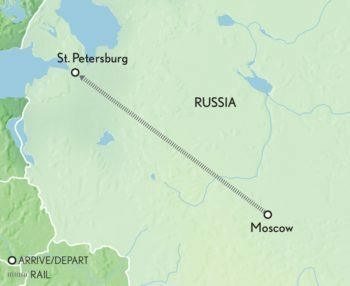 Board a high-speed train for a lively ride to St. Petersburg. On arrival, check in to your hotel, and then sit down to a Russian afternoon tea. Later, enjoy a boat cruise on the city’s canals that ends at Peter and Paul Fortress, where you experience a choir concert of Russian spiritual music, followed by dinner at a popular restaurant. Travel to Petrodvorets, summer palace of Peter the Great, to view its grounds, sculptures and fountains. Return to St. Petersburg by hydrofoil (weather permitting). This evening, view St. Isaac’s Cathedral, and then take part in a private culinary master class and dinner for an engaging and memorable Chef’s Table experience. Beat the crowds with special early entry to the world-famous Hermitage Museum to marvel at its spectacular art collections in peace and quiet. Break for lunch in a nearby restaurant, then return in the afternoon to view the famous Impressionists collection in the museum’s General Staff Building. This evening, attend a performance in one of St. Petersburg’s beautiful historic theatres. Journey to Pushkin to discover the magnificent 18th-century Catherine Palace, designed to rival Versailles. Enter the rarely visited Cold Bath and Agate Rooms to see the palace’s only surviving original interiors. Enjoy lunch at a local restaurant and visit Pavlovsk Palace and Park. Then, return to St. Petersburg. Tour the city, entering the ornate Church of the Saviour on Spilled Blood to behold its delicate mosaics and visiting the Fabergé Museum to see its glittering Fabergé eggs and other objets d’art. Enjoy your afternoon at leisure. This evening, enjoy a private visit and concert at the Isaak Brodsky House Museum, which is dedicated to an honored Russian painter and teacher. Then savour a tasting of Russian caviars as a fitting prelude to your farewell dinner.